Nestling in the magnificent forests of the Ardennes, Spa-Francorchamps is one of the truly great circuits. The combination of tight bends, sweeping curves and the rises and falls as it winds its way through the countryside is simply awesome. It's fast, challenging and exhilarating. Drivers love it and fear it and for spectators it is an amazing spectacle. And it is even better when you drive it in your own classic car! The 9th Spa Classic event will give you the opportunity to watch from a variety of grandstands, to explore the paddocks and even, if you wish, to make your way through the woods to the far reaches of the track to enjoy the racing from the high banks at Pouhon, Blanchimont or Fagnes. Throughout the weekend the paddocks are open to the public and car club collections create an inspiring museum of motoring history on the infield of the track. On track there's an impressive line up of cars and grids to suit all tastes. As with the Le Mans Classic, track laps are available thoughout the weekend. Prototypes and GT's that have raced in the greatest endurance races in the world between 1966 and 1979. Races for Formula 2 single seater cars that competed in the European Championship between 1967-78. This grid includes cars from pre-1966 with under two litre capacity. This retrospective of the Spa 24 Hours will feature 2 grids of touring cars. They are separated in to a grid for cars with under 2 litre engines from before 1966, and another grid for pre 1985 or with engines greater than 2 litres. Dedicated to cars that have competed in famous endurance races between 1983 & 1991. Pre 1963 sports cars and pre 1966 GT cars. U2 Touring CarsThis grid includes cars from pre-1966 with under two litre capacity. 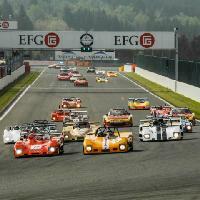 A brand new race dedicated to beautiful Italian sports cars and GT's built before 1966. We are very pleased to offer another circuit hotel maintaining our reputation to offer motorsport supply in the most desirable locations; the 4 star Hotel De La Source is located right next door to the circuit at La Source and offers 90 well appointed guest rooms. Each comfortable guest room provides tea and coffee making facilities, satellite TV and complimentary Wi-Fi. The air-conditioned rooms are spacious and include a work desk and a minibar. A robe and slippers are also provided. There is also a restaurant, bar, gym and sauna. The Hotel De La Source has been voted the best hotel in Francorchamps by subscribers of Trip Advisor. If you would prefer to stay at the circuit, we can offer the Hostellerie Le Roannay which is only 800 metres from the circuit. The three star Le Roannay has 17 rooms and is a comfortable, traditional, family run hotel wonderfully located. There is a heliport, free car parking, a relaxing outdoor terrace and a restaurant with an extensive wine list. Members of the Ferrari F1 Team frequently stay here during the F1 weekend. Pitlane Lodge is just 600 metres away from the legendary Spa Francorchamps circuit, in the heart of the Francorchamps village. The hotel offers cosy accommodation with flat-screen TV and free Wi-Fi. Parking is available in the street or behind the hotel, there is school parking which is available every day. The rooms come with basic furnishings and have a private bathroom. Other amenities include a TV and a DVD player. The daily buffet breakfast includes freshly baked breads, various spreads and fresh coffee and tea. There is also an in-house restaurant at Pitlane Lodge, offering a menu of regional dishes and fondue specialities. There is also a rustic bar serving light snacks and typical Belgian beers. 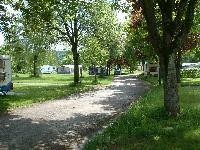 The excellent Eau Rouge campsite is privately owned and run and offers a peaceful and green environment for camping and caravans. The well regarded campsite includes recently refurbished shower and toilet blocks, optional water and electric supply as well as a bar / restaurant. There is also a supermarket within walking distance of the campsite. To the Stavelot corner, it is approximately 1.5 km. To La Source, it is approximately another 2.5 km. Alternatively one could drive or cycle. The campsite has a good atmosphere with like minded classic enthusiasts. Excellent chalets are also available; chalets can host 4 guests and have a twin bedroom and a double bedroom. There is a shower and a toilet and kitchen equipment but no television. Sheets / duvets / pillows / towels are not supplied. If your car is pre-1966 or on the permitted list, then you may park on the infield free of charge where your car will be part of the display of classic cars. If you are travelling in a modern car, then parking is available in one of the car parks on the outside of the track; the cost is £25 per car for the 3 days. The Spa Classic is open to the public on Friday, Saturday and Sunday. All tickets allow general admittance and access to the paddocks and grandstands. The weekend tickets are 3-day tickets, including Friday. A correct dress code is required at all times inside the circuit. Grandstand seats are not numbered for this event. Only eligible cars are accepted for track laps - please call reservations to check if your vehicle is eligible. There will be a pace car in operation for both "beginner" or "skilled" sessions. These are not competitive track days & you will be taking your car on to the circuit at your own risk. Helmets are mandatory as is the signing of a disclaimer form. Lunch can be reserved in the Drivers' Club in the Maison de L'Eau Rouge for between 12:00-15:00. This is available on Friday, Saturday and Sunday and the cost is £79 per person. Automobilia will also be present at the Spa-Classic. Exhibitors of all kinds, artists, booksellers, small-scale models, posters and many other items will once again bring the circuit to life. A good opportunity for collectors to add new pieces to their treasures, find what they have always been looking for and also discover the racing history of the Spa-Francorchamps racetrack. An exceptional auction is expected to be held on Saturday afternoon in a lounge above the F1 pits. Beaulieu meets Spa! Details to be confirmed.